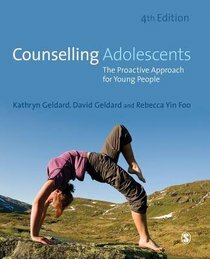 About "Counselling Adolescents: The Proaction Approach For Young People (4th Edition)"
David Geldard (MAPS Member of Australian Psychological Society) is a Counsellor and Psychologist who has a particular interest in training counsellors in ways to work with emotionally and behaviourally disturbed children and adolescents. He is currently focusing on the production of educational resources for counsellors and psychologists including Basic Personal Counselling: A Training Manual for Counsellors (6th edition), Counselling children: A Practical Introduction, Practical Counselling Skills and Counselling Adolescents. Dr Kathryn (Kitty) Geldard is a lecturer in the School of Psychology and Counselling at the Queensland University of Technology in Brisbane, Australia. She has previously worked in private practice as a Child and Family Therapist and at the Child and Youth Mental Health Service in Queensland as a Psychotherapist. She carried out research on Adolescent Peer Counselling to gain her PhD, has a Masters Degree in Counselling, and is a registered Occupational Therapist in Australia. She worked and trained in the United States and in Australia to work with children and adolescents psychotherapeutically.